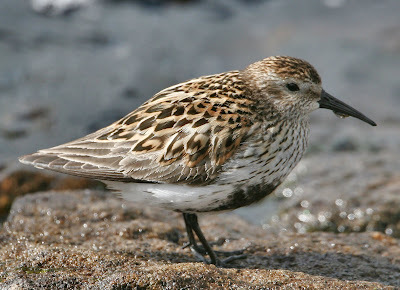 Dunlin on the Pitchings (c) 2009 Double Click the image!!! W F5 gusting F7, 6degC initially, 30 increasing 100km+, 3/8 - 8/8 variable, heavy showers at times, QNH 1023 rising. Just too windy up here for much movement to be seen. A very heavy downpour just before and at first light probably put the mockers on it as well. A few Swallows were noted moving low NW along and in the lee of the embankment so there could have been more low unseen. Numbers definately picked up as the morning progressed. 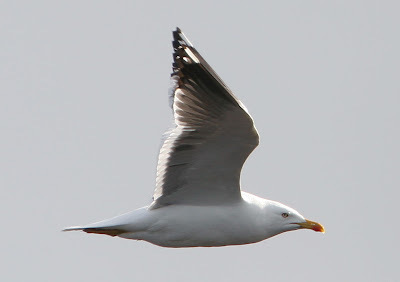 LBB Gulls were still going for it moving high and struggling into the wind throughout the morning.... some of the more distant ones remined uncounted today. 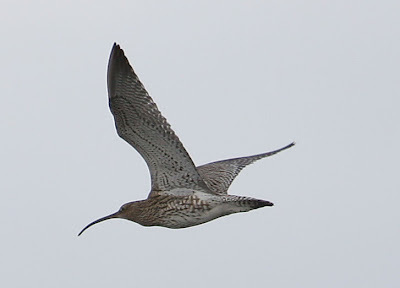 Very interestingly Curlews were still on the move NW, also all that were seen going high. 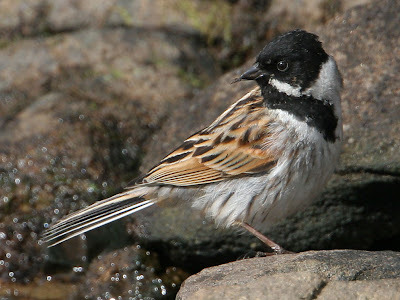 The best bird of the day, not vis but a product of the conditions of the day was a pristine female White Wagtail being chivvied away by first a male Pied and then later on a female!! Close viewes were brief but it remained scopeable for a considerable period of time. A Grey Heron passed low over the water and kept on going way out over the Worth Basin NW. A chacking Ring Ouzel remained unseen! PS: BS reported a good early move of Swallows just after rain had stopped all low and fast > N. 48 between 0715-0730hr at Ogden just over the hill.